Dec 26, 2018: The Eicher Pro 1110 features a deck body built with a tiltable cabin. Inside the cabin, there is a power tiltable steering available, while the manual is standard. Along with this, the adjustable seat and the information display take the comfort of the driver to the next level. The vehicle comes with an excellent payload capacity of nine tonnes, which means the truck can be used to carry a lot of carriage and cargo. The ground clearance and the wheelbase of the vehicle are 220 mm and 5,050 mm respectively. The truck is powered by a 3.3-litre engine that belts out a maximum power of 135 bhp, coming at 2,600 rpm, and the peak torque is 450 Nm, coming at a range of 1,200-1,800 rpm. In some features this truck is better than tata like average and cabin confort . most of the time i saw that tata cabin fitting as not comfotable as eicher like tata cabin fluctuate rather multi-dimensionally at the time of driving but i do not know why. 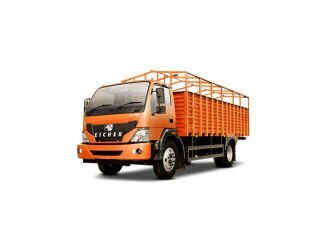 Eicher has started out selling the Commercial Vehicles in India from 2008 in partnership with Volvo under VE Commercial Vehicle Limited name and since then, it has carved a separate niche for itself. There are many trucks made available by the company and its Pro Series is particularly famous of the robust body, durable parts, low maintenance, effective mileage and power packed performance. Pro 1110 is one of the important trucks in series with features like swift pick up with full load capacity, best in class payload, cozy interiors and better resale value. Available in 2 wheelbase options with 4 cargo body types, it could be used for a number of applications like for carrying FMCG, industrial components, beverages, construction material and grocery items. Fitted with E483 3298cc 4-Cylinder Turbocharged Inetercooler Diesel engine, Pro 1110 could easily produce 110 hp power @ 2,800 rpm and 330 Nm torque @ 1,400-1,600 rpm. The power is, however, on lower side, but the torque covers for that and makes the truck smoothly move with all of its load capacity. Coming to its performance, the gradeability quotient is good enough with 24% while mated with 5-Speed Hybrid GSL gear transmission box. Also, the 310 mm diameter Single Dry Plate Type clutch helps to make the gear shifting smoother and BS-III emission standard make it fit for the environment. It has fuel tank capacity of 190 Litres which enable it to go moderate distances with ease. It is available with two wheelbase options, i.e. 3,800 mm and 4,300 mm, which further is available in 3 different load body length options and 4 cargo body type options. The 3,800 mm option has 5,230 mm load body length and is available in Fixed Side Deck (FSD), Drop Side Deck (DSD), High Side Deck (HSD) and CAB. On the other side, 4,300 mm option has 2 different cargo body length of 5,815 mm and 6,085 mm, available in all the body types, i.e. FSD, DSD, HSD and CAB. The width and ground clearance of load body for all variants is same, 2,125 mm and 220 mm. It has one of the highest payload capacity in its class with Gross Vehicle Weight (GVW) standing at 11,950 kg including kerb weight of 3,848 kg, thus making the payload capacity 8,102 kg. Having the choice of optional power steering, it has 6 degree tilting and 30 mm telescopic movement steering to make it comfortable for driver to adjust it as per his own needs. Pro 1110 has Semi Elliptical Leaf Springs with Shock Absorbers at both front and rear to keep the drive bump free and smooth irrespective of the terrain and load it is carrying. Eicher’s Joint Venture with Volvo, under which it is selling the commercial products, is famous for keeping the standards pretty high while it comes to braking and safety of the passengers. Pro 1110 has been equipped with Dual Circuit Full Air S Cam service brakes with VOSS fitment and the same Dual Circuit Full Air S-Cam exhaust brakes and parking brakes. This system in accordance with each other acts at one unit to stop the truck at any instant without much slipping. For ensuring further safety, there are 8.25 x20 - 14 PR tyres and High Strength Material body structure to keep the injuries at bay in an accident. Just like the other trucks in India, Pro 1110 also doesn’t have too much describe when to comes to Design and Comfort part. However, the basic things like ladder climb cabin, proper headlamp and taillamps, big enough radiator grille and air inlet space, wider wind-shield, adjustable drive seat and normal standard seats.